Welcome to our homestay in Khajuraho! We are Vijay and Vio, an Indo-French couple living with our young daughter, one of our nephew, an Vijay’s mum. We rent 2 single or double bedrooms with a shared hot-shower bathroom. With the possibility to add one extra (single) bed, we can accommodate 5 guests in total. In our homestay in Khajuraho you will live an authentic Indian family experience in an idyllic setting, while enjoying comfort and privacy. Our house is located in a quiet rural area of Khajuraho, at the edge of the Old Village in the middle of the Eastern group of temples. We live right in front of the Nanora Lake and the Brahma Temple (the oldest of all Khajuraho temples), and we can see the Vamana and the Jawari temples from our rooftop. The town centre of Khajuraho and the Western group of temples is also just about 10-15 minutes walk away from our house. During your entire stay at our homestay in Khajuraho, we will make sure that you are happy and at ease. You will also have the option to share our home food, and if you so wish we will guide you in and around Khajuraho. Although most people only come for the temples, there is a lot more you can do! To find out what, you can read our page on what to see & do in Khajuraho. We also offer Hindi classes, Indian violin classes, Reiki treatment, and henna tattoo – click for more information. We try to make our local environment a better place, and we recently founded our association. Our projects include a small school for local children and a cloth bag project. We also work a partnership with a small Norwegian association to sponsor a poor family and run literacy classes near Khajuraho. 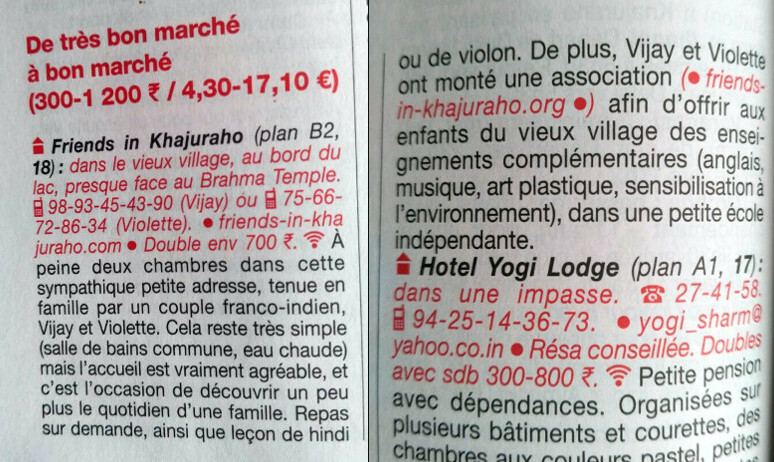 You are welcome to participate in one of our actions during your stay in Khajuraho. For those who only want to come to Khajuraho for the day, our homestay in Khajuraho offers a day service. This means that you can use our bathroom, eat in our home, and we will keep your luggage in a safe place while are away sightseeing.